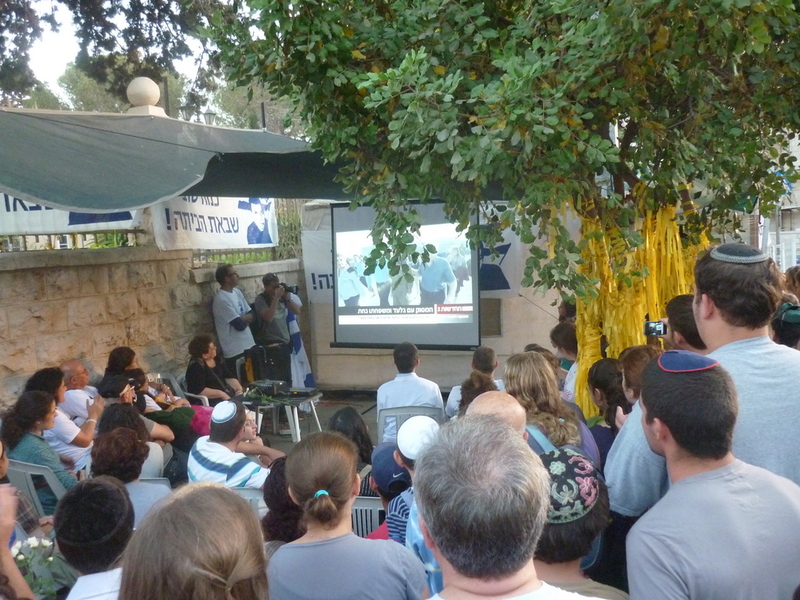 During Sukkot, there is a march through the city each year, usually people from different government organisations like the army, the Magon David ambulance, El-Al airlines etc as well as groups of Christians from all over the world with flags from their respective countries. The event was just over as I took this stretched picture, but people were sitting on hotel balconies and out in the street with armed guards and buses parked sideways in the roads as make shift barricades. I had to run some errands for some people at work which involved taking a 8 mile or so ride in a car to drop off some food for a staff meeting. On the way was a helicopter close to a main road that had either just landed or about take off next to a police station. Quite possibly part of the process of releasing the prisoners. 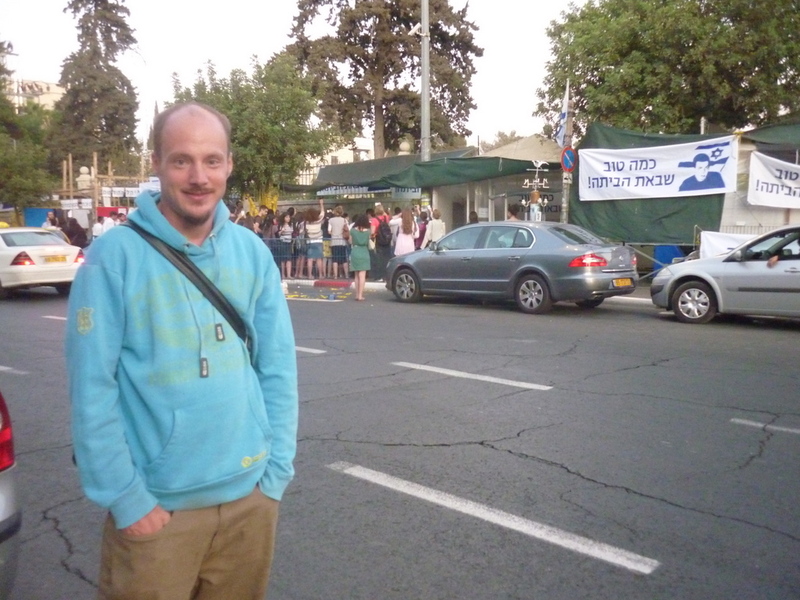 I have been praying for Gilad and written some updates here as I used to pass tents campaigning for his release every day. Later on I went to a convenience store to get something for lunch to see a 5 second video of Gilad drinking a bottle of water next to a helicopter and smiling, so this was proof Gilad was coming home and so desperately what the people of this nation wanted to see, although there was understandable anguish from families who had lost loved ones to terrorism. If you see the tall overhead traffic light in the above picture, if you turn right, this heads down Berlin Street, just a few yards down there is the Gilad Schalit tent which I have visited before. This place is a kind of protest structure and shrine to this young man locked up for 5 years. Outside this spot, there isn’t as many people as I thought, but the atmosphere is still buzzing!! Here, I got to watch the TV on a projector as they showed Gilad in a car been taken to his parents house in the upper Galilee, there is a emotional sense of satisfaction as it shows the front door of his family’s home shut giving him some much needed privacy and he looked clearly pale and disoriented when on the TV. This was a really good to be in this city when this history making event happened. I think we need thanks for our loving Father in heaven that has been a happy ending to this ordeal, and I hope everyone in Israel and overseas who has been watching this does too. Part of the quirky nature of Jerusalem means I often see friends, Christian, Jewish and Arab, natives, immigrants and foreigners accidentally in different parts of the city, I hope to one day see Gilad here and shake his hand when hes in a fit state to get around. 🙂 I expect hes going to want to know what a Facebook is and amazed at the amount of publicity there has been to get him free. A few days ago, a friend from my church pointed out some interesting scripture about Sukkot and foreign Christians gentiles visiting… more soon!